Most people see the word Vindaloo and think – HOT!!!!! – I don’t want anything that hot. Unless you’re like me and buy insanely hot chilli sauces just so you can inflict them on your friends and colleagues. If you go on the title you’ll probably avoid this dish – until you check the ingredients list and realise it can’t possibly be hot. Yes there are spices – and yes there is one red chilli – but it’s just a regular red chilli – not a Scotch Bonnet or Ghost Pepper. 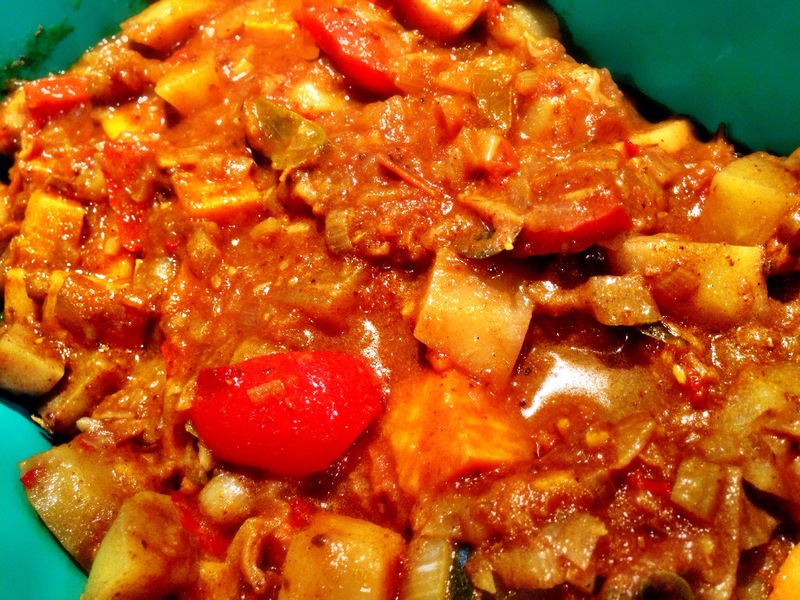 Vindaloo – means Wine and Potatoes. (vin = wine) (aloo = potatoes) and was created by the Portugese (and not the Indians as you might originally have assumed. The dish evolved and the wine was typically substituted for vinegar. This dish conforms to all those rules – only in this case we have sweet potatoes and waxy potatoes (mine were new potatoes) cooked in a tomato and spiced sauce with garlic and white wine vinegar – along with a red pepper. I made a lot of this. More than 3 meals worth and – as it says in the book – it just gets better the longer you leave it. This is the third day – and the spices have just made the dish even better. Ottolenghi has some amazing recipes in the Plenty book – it’s one of the best books I own. This dish is excellent – although I think a contrasting dish alongside would be good. So we ran out of food midweek. This only ever happens when we are oncall for work and can’t go out ! Anyway I decided to dig out my copy of Yotam Ottolenghi – Plenty. This was the first book I scoured for recipes and struggled to eliminated anything I didn’t want to cook. 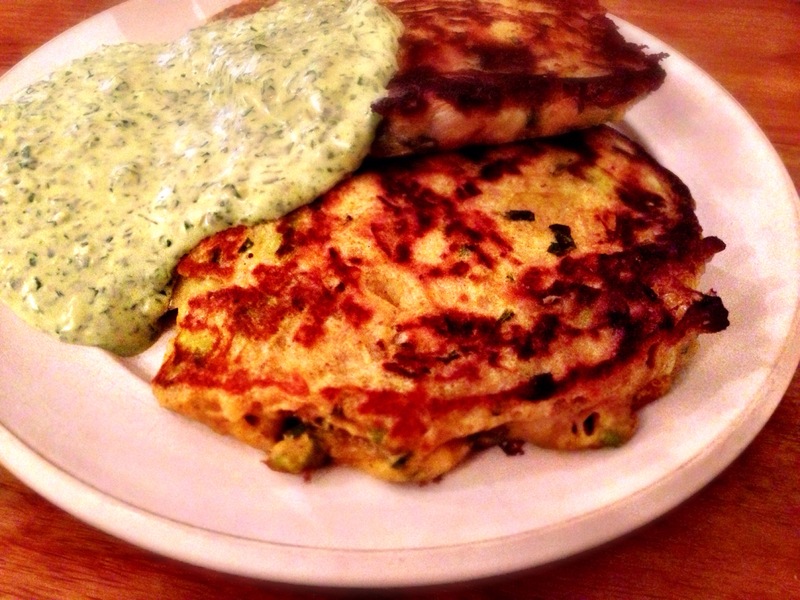 In the end I made half the things in the book – including the Leek Fritter dish. Sadly I forgot to take a photo at the time – hence me making it again. This isn’t a quick dish – but it is worth the effort. It certainly fills a hole and is very tasty. All you do is sauté some leeks and shallots and once they have cooled down toss them in a spiced batter and egg white mixture. Fry them like pancakes and they go all fluffy in less than 5 minutes – mainly due to all the self raising flour and baking powder. These are really yummy – especially with the yoghurt and sour cream dip which has been blended with garlic, coriander, parsley and lemon juice. They must be good. My mother in law loved them! A definite keeper – and you can make these in advance – and take them to work the next day and reheat.